Asuka, now useless as an Evangelion pilot, has been taken by the intelligence division, and placed in hospital under sedation. But no sooner had Asuka been recovered, that a new EVA pilot -- the 5th child -- has been discovered, and sent to NERV from the committee directly. 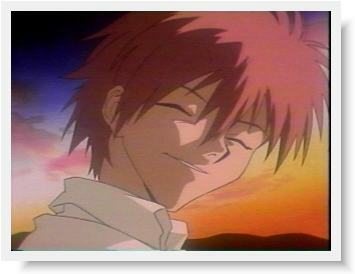 Yet there is something strange about this latest young boy, Nagisa Kaoru. Something unusual that Shinji finds disturbing, Rei strangely familiar, and a complete bewilderment to the Evangelion support staff. In a strange twist of irony, Anno turns Asuka into a reflection of her mother... In fact, this seems to be a pet theme of his, where one's fate is pre-determined, and that your own personality make-up will be a mere reflection of you parents'. Instead of become a fully realised three-dimensional character, Shinji never seems to grow. He's always facing the same inner conflict, and seems unable to find a resolution. In fact, the same could be said for all the characters in this series. None of the characters actually grow. While this may be perfectly suitable for an unemotional Rei, this certainly does not work for any of the other characters in the series -- well, I guess it's fine for Pen-Pen, but your personality would freeze solid too if you made your home in a sub-zero!